The media’s demand for certainty — and its lack of statistical rigor — is a bad match for our complex world. This is the 11th and final article in a series that reviews news coverage of the 2016 general election, explores how Donald Trump won and why his chances were underrated by most of the American media. Two Saturday nights ago, just as Hurricane Irma had begun its turn toward Florida, the Associated Press sent out a tweet proclaiming that the storm was headed toward St. Petersburg and not its sister city Tampa, just 17 miles to the northeast across Tampa Bay. Hurricane forecasts have improved greatly over the past few decades, becoming about three times more accurate at predicting landfall locations. But this was a ridiculous, even dangerous tweet: The forecast was nowhere near precise enough to distinguish Tampa from St. Pete. 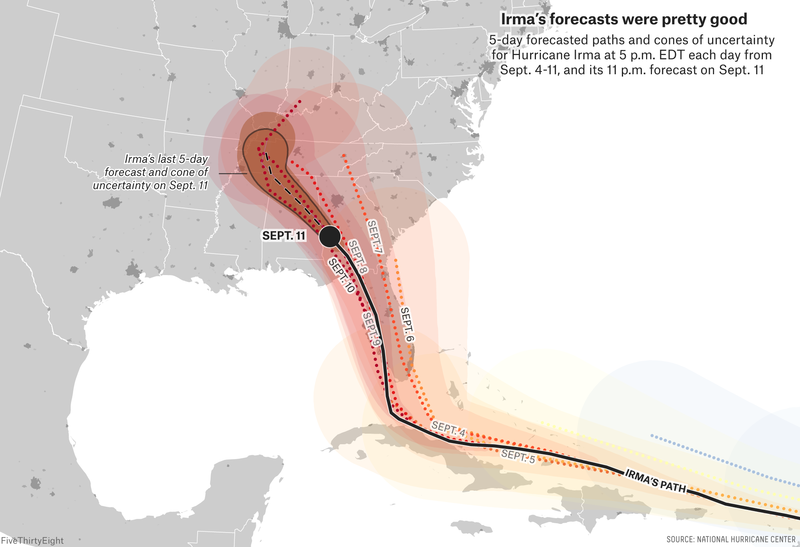 For most of Irma’s existence, the entire Florida peninsula had been included in the National Hurricane Center’s “cone of uncertainty,” which covers two-thirds of possible landfall locations. The slightest change in conditions could have had the storm hitting Florida’s East Coast, its West Coast, or going right up the state’s spine. Moreover, Irma measured hundreds of miles across, so even areas that weren’t directly hit by the eye of the storm could have suffered substantial damage. By Saturday night, the cone of uncertainty had narrowed, but trying to distinguish between St. Petersburg and Tampa was like trying to predict whether 31st Street or 32nd Street would suffer more damage if a nuclear bomb went off in Manhattan. To its credit, the AP deleted the tweet the next morning. But the episode was emblematic of some of the media’s worst habits when covering hurricanes — and other events that involve interpreting probabilistic forecasts. Before a storm hits, the media demands impossible precision from forecasters, ignoring the uncertainties in the forecast and overhyping certain scenarios (e.g., the storm hitting Miami) at the expense of other, almost-as-likely ones (e.g., the storm hitting Marco Island). Afterward, it casts aspersions on the forecasts unless they happened to exactly match the scenario the media hyped up the most. Indeed, there’s a fairly widespread perception that meteorologists performed poorly with Irma, having overestimated the threat to some places and underestimated it elsewhere. Even President Trump chimed in to say the storm hadn’t been predicted well, tweeting that the devastation from Irma had been “far greater, at least in certain locations, than anyone thought.” In fact, the Irma forecasts were pretty darn good: Meteorologists correctly anticipated days in advance that the storm would take a sharp right turn at some point while passing by Cuba. The places where Irma made landfall — in the Caribbean and then in Florida — were consistently within the cone of uncertainty. The forecasts weren’t perfect: Irma’s eye wound up passing closer to Tampa than to St. Petersburg after all, for example. But they were about as good as advertised. And they undoubtedly saved a lot of lives by giving people time to evacuate in places like the Florida Keys. You won’t be surprised to learn that I see a lot of similarities between hurricane forecasting and election forecasting — and between the media’s coverage of Irma and its coverage of the 2016 campaign. In recent elections, the media has often overestimated the precision of polling, cherry-picked data and portrayed elections as sure things when that conclusion very much wasn’t supported by polls or other empirical evidence. As I’ve documented throughout this series, polls and other data did not support the exceptionally high degree of confidence that news organizations such as The New York Times regularly expressed about Hillary Clinton’s chances. (We’ve been using the Times as our case study throughout this series, both because they’re such an important journalistic institution and because their 2016 coverage had so many problems.) On the contrary, the more carefully one looked at the polling, the more reason there was to think that Clinton might not close the deal. In contrast to President Obama, who overperformed in the Electoral College relative to the popular vote in 2012, Clinton’s coalition (which relied heavily on urban, college-educated voters) was poorly configured for the Electoral College. In contrast to 2012, when hardly any voters were undecided between Obama and Mitt Romney, about 14 percent of voters went into the final week of the 2016 campaign undecided about their vote or saying they planned to vote for a third-party candidate. And in contrast to 2012, when polls were exceptionally stable, they were fairly volatile in 2016, with several swings back and forth between Clinton and Trump — including the final major swing of the campaign (after former FBI Director James Comey’s letter to Congress), which favored Trump. By Election Day, Clinton simply wasn’t all that much of a favorite; she had about a 70 percent chance of winning according to FiveThirtyEight’s forecast, as compared to 30 percent for Trump. Even a 2- or 3-point polling error in Trump’s favor — about as much as polls had missed on average, historically — would likely be enough to tip the Electoral College to him. While many things about the 2016 election were surprising, the fact that Trump narrowly won1 when polls had him narrowly trailing was an utterly routine and unremarkable occurrence. The outcome was well within the “cone of uncertainty,” so to speak. Probably the most important problem with 2016 coverage was confirmation bias — coupled with what you might call good old-fashioned liberal media bias. Journalists just didn’t believe that someone like Trump could become president, running a populist and at times also nationalist, racist and misogynistic campaign in a country that had twice elected Obama and whose demographics supposedly favored Democrats. So they cherry-picked their way through the data to support their belief, ignoring evidence — such as Clinton’s poor standing in the Midwest — that didn’t fit the narrative. But the media’s relatively poor grasp of probability and statistics also played a part: It led them to misinterpret polls and polling-based forecasts that could have served as a reality check against their overconfidence in Clinton. The idea behind an election forecast like FiveThirtyEight’s is to take polls (“Clinton is ahead by 3 points”) and transform them into probabilities (“She has a 70 percent chance of winning”). I’ve been designing and publishing forecasts like these for 15 years3 in two areas (politics and sports) that receive widespread public attention. And I’ve found there are basically two ways that things can go wrong. You’ll read lots of clips like this during an election campaign, full of claims about the “electoral math,” and they often don’t hold up to scrutiny. In this case, the article’s assertion that the loss of “a few percentage points” wouldn’t hurt Clinton’s chances of victory was wrong, and not just in hindsight; instead, the Comey letter made Clinton much more vulnerable, roughly doubling Trump’s probability of winning. But even if you get the modeling right, there’s another whole set of problems to think about: errors of interpretation and communication. These can run in several different directions. Consumers can misunderstand the forecasts, since probabilities are famously open to misinterpretation. But people making the forecasts can also do a poor job of communicating the uncertainties involved. For example, although weather forecasters are generally quite good at describing uncertainty, the cone of uncertainty is potentially problematic because viewers might not realize it represents only two-thirds of possible landfall locations. Intermediaries — other people describing a forecast on your behalf — can also be a problem. Over the years, we’ve had many fights with well-meaning TV producers about how to represent FiveThirtyEight’s probabilistic forecasts on air. (We don’t want a state where the Democrat has only a 51 percent chance to win to be colored in solid blue on their map, for instance.) And critics of statistical forecasts can make communication harder by passing along their own misunderstandings to their readers. After the election, for instance, The New York Times’ media columnist bashed the newspaper’s Upshot model (which had estimated Clinton’s chances at 85 percent) and others like it for projecting “a relatively easy victory for Hillary Clinton with all the certainty of a calculus solution.” That’s pretty much exactly the wrong way to describe such a forecast, since a probabilistic forecast is an expression of uncertainty. If a model gives a candidate a 15 percent chance, you’d expect that candidate to win about one election in every six or seven tries. You wouldn’t expect the fundamental theorem of calculus to be wrong … ever. First, as I mentioned, no exact outcome is all that likely. If you rounded the popular vote to the nearest whole number, the most likely outcome was Clinton winning by 4 percentage points. Nonetheless, the chance that she’d win by exactly 4 points8 was only about 10 percent. “Calling” every state correctly in the Electoral College is even harder. FiveThirtyEight’s model did it in 2012 — in a lucky break9 that may have given people a false impression about how easy it is to forecast elections — but we estimated that the chances of having a perfect forecast again in 2016 were only about 2 percent. Thus, properly measuring the uncertainty is at least as important a part of the forecast as plotting the single most likely course. You’re almost always going to get something “wrong” — so the question is whether you can distinguish the relatively more likely upsets from the relatively less likely ones. Second, the distribution of possible outcomes was fairly wide last year. The distribution is based on how accurate polls of U.S. presidential elections have been since 1972, accounting for the number of undecideds and the number of days until the election. The distribution was wider than usual because there were a lot of undecided voters — and more undecided voters mean more uncertainty. Even in a normal year, however, the polls aren’t quite as precise as most people assume. Third, the forecast is continuous, rather than binary. When evaluating a poll or a polling-based forecast, you should look at the margin between the poll and the actual result and not just who won and lost. If a poll showed the Democrat winning by 1 point and the Republican won by 1 point instead, the poll did a better job than if the Democrat had won by 9 points (even though the poll would have “called” the outcome correctly in the latter case). By this measure, polls in this year’s French presidential election — which Emmanuel Macron was predicted to win by 22 points but actually won by 32 points — were much worse than polls of the 2016 U.S. election. Finally, the actual outcome in last year’s election was right in the thick of the probability distribution, not out toward the tails. The popular vote was obviously pretty close to what the polls estimated it would be. It also wasn’t that much of a surprise that Trump won the Electoral College, given where the popular vote wound up. (Our forecast gave Trump a better than a 25 percent chance of winning the Electoral College conditional on losing the popular vote by 2 points,10 an indication of his demographic advantages in the swing states.) One might dare even say that the result last year was relatively predictable, given the range of possible outcomes. I’ve often heard it asserted that the widespread presumption of an inevitable Clinton victory was itself a problem for her campaign11 — Clinton has even made a version of his claim herself. So we have to ask: Could this misreading of the polls — and polling-based forecasts — actually have affected the election’s outcome? It depends on whether you’re talking about how the media and other political elites read the polls — and how that influenced their behavior — or how the general public did. Regular voters, it turns out, were not especially confident about Clinton’s chances last year. For instance, in the final edition of the USC Dornsife/Los Angeles Times tracking poll, which asked voters to guess the probability of Trump and Clinton winning the election, the average voter gave Clinton only a 53 percent chance of winning and gave Trump a 43 percent chance — so while respondents slightly favored Clinton, it wasn’t with much confidence at all. The American National Election Studies also asked voters to predict the most likely winner of the race, as it’s been doing since 1952. It found that 61 percent of voters expected Clinton to win, as compared to 33 percent for Trump.12 This proportion is about the same as other years — such as 2004 — in which polls showed a fairly close race, although one candidate (in that case, George W. Bush) was usually ahead. While, unlike the LA Times poll, the ANES did not ask voters to estimate the probability of Clinton winning, it did ask voters a follow-up question about whether they expected the election to be close or thought one of the candidates would “win by quite a bit.” Only 20 percent of respondents predicted a Clinton landslide, and only 7 percent expected a Trump landslide. Instead, almost three-quarters of voters correctly predicted a close outcome. WHICH PARTY WILL WIN THE PRESIDENCY? So be wary if you hear people within the media bubble13 assert that “everyone” presumed Clinton was sure to win. Instead, that presumption reflected elite groupthink — and it came despite the polls as much as because of the polls. There was a bewilderingly large array of polling data during last year’s campaign, and it didn’t always tell an obvious story. During the final week of the campaign, Clinton was ahead in most polls of most swing states, but with quite a few exceptions14 — and many of Clinton’s leads were within the margin of error and had been fading during the final 10 days of the campaign. The public took in this information and saw Clinton as the favorite, but they didn’t expect a blowout and viewed the outcome as highly uncertain. Our model read it the same way. The media looked at the same ambiguous data and saw what they wanted in it, using it confirm their presumption that Trump couldn’t win. During the 2012 election, FiveThirtyEight’s forecast consistently gave Obama better odds of winning re-election than the conventional wisdom did. Somehow in the midst of it, I became an avatar for projecting certainty in the face of doubt. But this role was always miscast — even quite opposite of what I hope readers take away from FiveThirtyEight’s work. In addition to making my own forecasts, I’ve spent a lot of my life studying probability and uncertainty. Cover these topics for long enough and you’ll come to a fairly clear conclusion: When it comes to making predictions, the world usually needs less certainty, not more. A major takeaway from my book and from other people’s research on prediction is that most experts — including most journalists — make overconfident forecasts. (Weather forecasters are an important exception.) Events that experts claim to be nearly certain (say, a 95 percent probability) are often merely probable instead (the real probability is, say, 70 percent). And events they deem to be nearly impossible occur with some frequency. Another, related type of bias is that experts don’t change their minds quickly enough in the face of new information,15 sticking stubbornly to their previous beliefs even after the evidence has begin to mount against them. Since then, the pendulum has swung too far in the other direction, with the media often expressing more certainty about the outcome than is justified based on the polls. In addition to lowballing the chances for Trump, the media also badly underestimated the probability that the U.K. would leave the European Union in 2016, and that this year’s U.K. general election would result in a hung parliament, for instance. There are still some exceptions — the conventional wisdom probably overestimated Marine Le Pen’s chances in France. Nonetheless, there’s been a noticeable shift from the way elections used to be covered, and it’s worth pausing to consider why that is. One explanation is that news organizations learned the wrong lessons from 2012. The “moral parable” of 2012, as Scott Alexander wrote, is that Romney was “the arrogant fool who said that all the evidence against him was wrong, but got his comeuppance.” Put another way, the lesson of 2012 was to “trust the data,” especially the polls. Another issue is that uncertainty is a tough sell in a competitive news environment. “The favorite is indeed favored, just not by as much as everyone thinks once you look at the data more carefully, so bet on the favorite at even money but the underdog against the point spread” isn’t that complicated a story, but it can be a difficult message to get across on TV in the midst of an election campaign when everyone has the attention span of a sugar-high 4-year-old. It can be even harder on social media, where platforms like Facebook reward simplistic coverage that confirms people’s biases. If you re-read the Times’ general election coverage from the conventions onward,16 you’ll be struck by how consistent it was from start to finish. Although the polls were fairly volatile in 2016, you can’t really distinguish the periods when Clinton had a clear advantage from those when things were pretty tight. Instead, the narrative was consistent: Clinton was a deeply flawed politician, the “worst candidate Democrats could have run,” cast in “shadows” and “doubts” because of her ethical lapses. However, she was almost certain to win because Trump appealed to too narrow a range of demographic groups and ran an unsophisticated campaign, whereas Clinton’s diverse coalition and precise voter-targeting efforts gave her an inherent advantage in the Electoral College. It was a consistent story, but it was consistently wrong. One can understand why news organizations find “the narrative” so tempting. The world is a complicated place, and journalists are expected to write authoritatively about it under deadline pressure. There’s a management consulting adage that says when creating a product, you can pick any two of these three objectives: 1. fast, 2. good and 3. cheap. You can never have all three at once. The equivalent in journalism is that a story can be 1. fast, 2. interesting and/or 3. true — two out of the three — but it’s hard for it to be all three at the same time. Deciding on the narrative ahead of time seems to provide a way out of the dilemma. Pre-writing substantial portions of the story — or at least, having a pretty good idea of what you’re going to say — allows it to be turned around more quickly. And narratives are all about wrapping the story up in a neat-looking package and telling readers “what it all means,” so the story is usually engaging and has the appearance of veracity. The problem is that you’re potentially sacrificing No. 3, “true.” By bending the facts to fit your template, you run the risk of getting the story completely wrong. To make matters worse, most people — including most reporters and editors (also: including me) — have a strong tendency toward confirmation bias. Presented with a complicated set of facts, it takes a lot of work for most of us not to connect the dots in a way that confirms our prejudices. An editorial culture that emphasizes “the narrative” indulges these bad habits rather than resists them. Instead, news organizations reporting under deadline pressure need to be more comfortable with a world in which our understanding of developing stories is provisional and probabilistic — and will frequently turn out to be wrong. FiveThirtyEight’s philosophy is basically that the scientific method, with its emphasis on verifying hypotheses through rigorous analysis of data, can serve as a model for journalism. The reason is not because the world is highly predictable or because data can solve every problem, but because human judgment is more fallible than most people realize — and being more disciplined and rigorous in your approach can give you a fighting chance of getting the story right. The world isn’t one where things always turn out exactly as we want them to or expect them to. But it’s the world we live in. CORRECTION (Sept. 21, 2:40 p.m.): A previous version of footnote No. 10 mistakenly referred to the Electoral College in place of the national popular vote when discussing Trump’s chances of winning the election. The article has been updated. If Trump had won in a landslide instead of narrowly, that would be a different story — more about that in a moment. Editor’s note: “Delight” is an understatement. Dating back to PECOTA’s debut in 2003. We’ve been pretty good about avoiding this type of mistake at FiveThirtyEight over the years — but not by any means perfect. The model FiveThirtyEight licensed for the 2015 U.K. election committed this type of error, for example, having assigned too small a probability to a Conservative majority because it wasn’t carefully designed. For instance, if Trump beat his polls in Michigan, he was also likely to do so in demographically similar states such as Wisconsin and Pennsylvania. 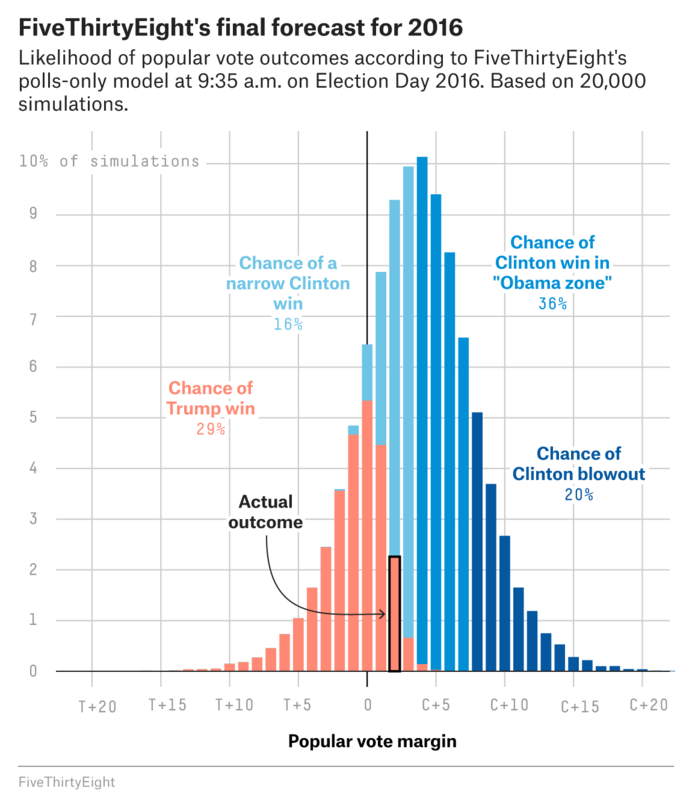 For this reason, we may experiment with listing probabilities as odds — e.g., Trump has a 2 in 7 chance — rather than as percentages in future election years. Again, rounding to the nearest whole number. In advance of 2012, we’d estimated our chances of calling every state right at about 20 percent. There was considerably more uncertainty in 2016, because more states were in play and because the high number of undecided voters made forecast errors larger. It also gave Trump about a 60 percent chance of winning the Electoral College conditional on losing the popular vote by 1 point. There are lots of plausible ways in which it could have been a problem. For instance, both Comey’s decision to release his letter on Oct. 28 and the way the media covered the Comey story may have been affected by the presumption that Clinton was almost sure to win. The survey was conducted from early September through the election, so it captures periods in which Clinton had both smaller and larger leads. I can’t find a scientific survey of journalists analogous to the ANES or LA Times polls, although a Politico straw poll of journalists conducted in March of 2016 found that 86 percent of them expected Clinton to win the election, as compared to just 10 percent for Trump. Most of the late polls showed her trailing Trump in Ohio and only about tied with him in Florida, for example. See Chapter 4 of Phil Tetlock’s “Expert Political Judgment” for more empirical evidence on this point. As I did last year in preparation for this series of articles.